Your car finance plan helps to spread the cost of a new or used car. Instead of paying the full amount up front, you pay monthly with interest. We offer a range of finance products to suit individual preferences and circumstances, such as Hire Purchase, Personal Contract Purchase and Lease Purchase. We also have a rental product known as Contract Hire, which is not subject to interest. Finance is available to UK residents aged 18 years or over, subject to status. 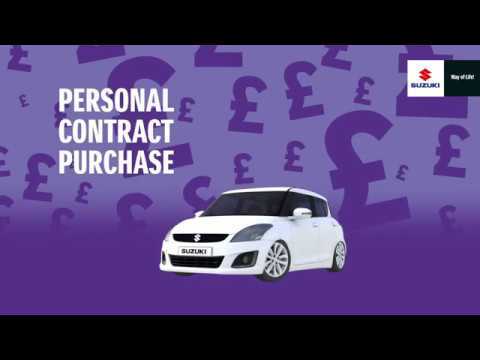 This video is intended merely to give you information on how Hire Purchase works. Suzuki Finance is a trading style of Suzuki Financial Services Limited, part of Lloyds Banking Group, St William House, Tresillian Terrace, Cardiff, CF10 5BH. Personal Contract Hire is provided subject to status by Suzuki Personal Contract Hire, which is a trading style of Lex Autolease Limited. Registered office: 25 Gresham Street, London EC2V 7HN. Applicants must be over 18 and a UK resident. Ownership of the vehicle remains with Lex Autolease Limited and the vehicle must be handed back at the end of the term. Return and mileage conditions apply. Your regular monthly repayments are low because it is the nature of a PCP product that a significant proportion of the total amount payable is repayable at the end of your agreement by one large final repayment payable one month after you have paid all your other repayments. Credit is available to UK residents aged 18 years or over, subject to status. If finance is needed when making a part exchange, you will need to enter into a new agreement (subject to status). Under the goods return option, you will have to make additional payments if the car is not in good condition for its age and mileage, or if the car has exceeded its allowed mileage. This video is intended merely to give you information on how Personal Contract Purchase works. Suzuki Finance is a trading style of Suzuki Financial Services Limited, part of Lloyds Banking Group, St William House, Tresillian Terrace, Cardiff, CF10 5BH.